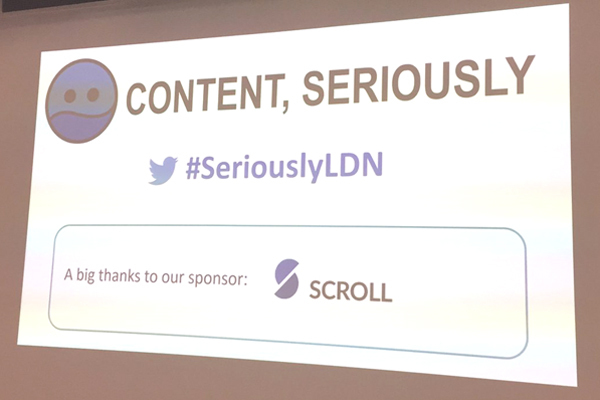 It’s like buses… you wait for an opportunity to find out about content design, and two come along at once. I recently blogged about Sarah Richards’ new Content Design book. And this week I attended a meetup on the same subject. Organised by Rahel Baillie, the event featured speakers from both the public and private sectors. Padma Gillen from Scroll previously worked with the Government Digital Service (GDS) and discussed the tools and techniques they used they evolved the new discipline of content design. Danielle Kirkwood from Intuit showed how content design can work in the context of a private sector company. That’s a recent development: content design has been largely taken up in the public and non-profit sectors, but other sectors such as financial services are now starting to take note. Content design has borrowed concepts from other disciplines: software development (user stories, acceptance criteria) and design (design patterns and “design thinking”). It can also benefit from “agile” project management: taking an iterative approach of continual improvement – getting feedback early rather than waiting for something to be “finished”. The “minimum viable product” concept can be adapted as “minimum viable content” – publish when something is factually accurate and meets user needs, even if the style isn’t perfect. Anyone who writes for a website could (should?) be a content designer. That applies whether you are a copywriter working on marketing text or a technical writer creating “help” content. Content design is about putting users first. Danielle talks to real customers to find out how they use her content and the language they use. At DGS, Padma did regular user testing. In both organisations, this is compulsory. Danielle had an excellent tip: use brand guidelines when your manager’s not in the room. Any ‘top down’ support for your craft can help you defend your decisions. What skills do you need to be a content designer? As a former journalist, I was happy to hear Padma comment: “I’ve met journalists who have become very good content designers – it’s how they think about users.” That makes sense because as a journalist you learn to put your readers first, writing what they want to read and adapting your voice and style for different audiences. Rahel’s vision is that content design is “the UX of content”: it’s about user experience. I like this concept very much. Content design and content strategy overlap because they are emerging disciplines and yet to be standardised. One day, said Padma, you will be able to do a university degree in them. ‹ Content design: what is it and how do you do it?